The Bruins are coming off of a three day brake and now have to go up against their bitter division foes, the Montreal Canadians. The Bruins last played on Saturday, Tuukka Rask got a shut out and the Bruins tallied one goal.The Canadians last played Sunday night and beat the Ottawa Senators 2-1. The Habs have been impressive so far this season with a 6-2 record (close to the Bruins 6-1-1 record). Goalie Carey Price has a impressive 1.70 goals against average and a solid .938 save percentage. The Habs are coming off of a disappointing 31-35-16 season missing the playoffs. Montreal had a lot to prove to their demanding (annoying, rude) fan base coming into the season. In the beginning of the season Montreal has proved that they're just as good as before. The Bruins will have to play in another tough game in the shortened season. 1) Injuries. 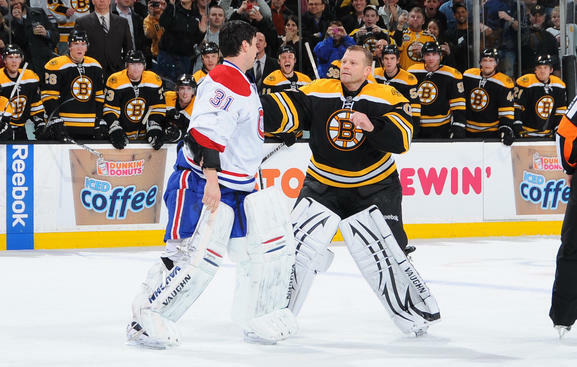 The Bruins have to face a few injuries this game versus the Habs. Leading goal scorer Brad Marchand is out with a shoulder injury, tough guy Shawn Thornton is out with a concussion, and grinder Daniel Paille is also out for tonight's game. The Bruins will look to Lane MacDermid, Ryan Spooner, and Jamie Tardif. The other Bruins will have to unite and use the great team chemistry they've built over the years to surpass the difficulty. The Bruins might want to play a more defensive game with so many changes to the lineup in tonight's game. 2) Offense. The Bruins only scored one goal against the Toronto Maple Leafs. Bruins players had chances but couldn't put the puck in the net. One Bruin who definitely needs to start putting the puck in the net is Tyler Seguin. Goals will come to Seguin eventually but the sooner the better and with Marchand out the Bruins really need Tyler to step it up for the big game tonight. 3) Impose. The Bruins let Buffalo knock them around in the last division rival game. If the Bruins want to remain the Beasts of the North East Division then they have to continue to impose their will and power. In a division rivalry game opportunities should arise. There is still bad blood between the teams because of the Chara on Pacioretty hit. Not just between players but fans. Fans in Montreal called the police and wanted Chara arrested. Perhaps the craziest thing is that the police seemed to oblige and the next time the two teams faced the team had to stay in Lake Placid. There is a lot of hate between the two teams. Hockey is best when the hate is brewing.